Elaine Cheung, Esq. is President of the Law Firm. In 2001, Ms. Cheung graduated with honors from the University of Pennsylvania. Ms. Cheung relocated to San Francisco, California and attended University of California, Hastings, where she was elected Student Body President of her law school, was a teacher's assistant for first year law students and was nominated for the distinguished moot court award of David E. Snodgrass Best Oralist. She has been the recipient of academic scholarships at every level of schooling from elementary school through law school. Born and raised in Philadelphia, she chose to return to her hometown to practice immigration law. As the daughter of immigrants, Ms. Cheung is devoted to guiding her clients through the complex immigration process with compassion and expertise. 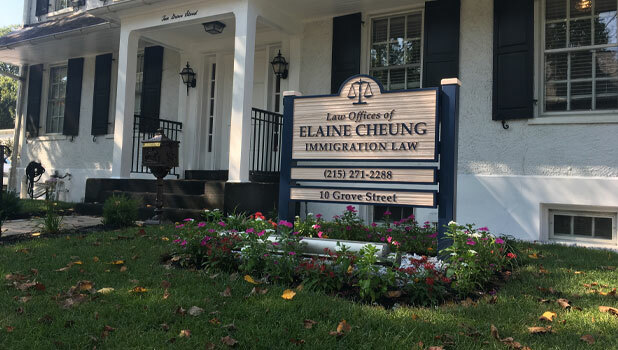 Ms. Cheung has been admitted to the Pennsylvania Supreme Court, New Jersey Supreme Court, California Supreme Court, U.S. District Court for the Eastern District of Pennsylvania, U.S. Court of Appeals for the Third Circuit, and she may practice in the Executive Office of Immigration Review: Immigration Courts in all 50 states. Her other professional memberships include the American Immigration Lawyers Association, the American Bar Association, and the Delaware Valley Asian-American Bar Association. She is solidly trilingual, and is fluent in Spanish and the Chinese dialect of Fuzhou. The staff members at the Law Offices of Elaine Cheung speak English, Spanish, Mandarin, Cantonese and Fuzhou. Immigration & Nationality Law: Visas, Asylum, Deportation Defense, Adjustment of Status, Inadmissibility Waivers, U-Visas, Deferred Action for Childhood Arrivals, Citizenship, and Family Law. We are open on Mondays, 9:00 a.m. to 7:00 p.m. to accommodate busy working clients and Tuesday - Friday 9:00 a.m. to 5:00 p.m. For a low cost consultation in our South Philadelphia law office, call 215-271-2288.